The different features of the portfolio module enable you to easily create, manage portfolios and strategical objectives. Align projects with business objectives. Prioritize initiatives and projects based on multiple criterias. Improve projects resource planning and assignment and concentrate investment on high value projects. Defines strategical objectives, group them and determine their impact levels. Select and add projects that are aligned with the goals of your portfolio and define their weight against each other. 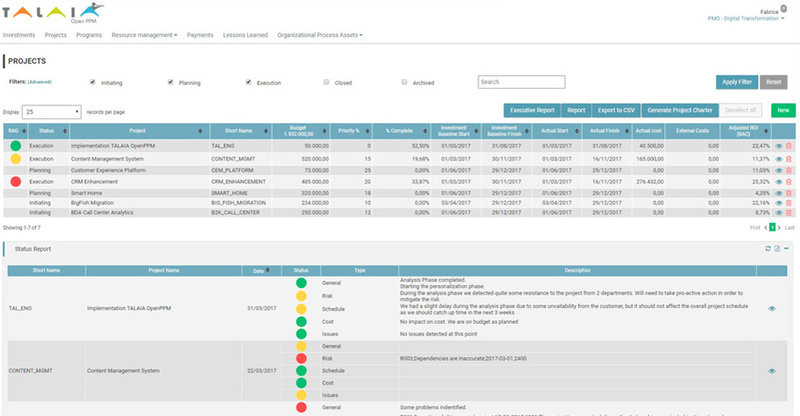 Thanks to the Scenario Simulator and Waterline graphics, Talaia helps you to easily define a list of projects to execute based upon their budget or priority. A centralized and unified information to manage your Project portfolios, programs and investment. One single source of information to set priorities for better decision making. Visualize your projects through a work breakdown structure. Organize project’s scope in work packages and tasks. Link ideas to activities and reach your targets. Project delays, over costs, issues? Use EVM to check your projects productivity, gain visibility and overcome problems. Control delivery dates using an interactive Gantt to anticipate delays. Use milestone management with multiple projects target dates. Plan workload and optimize your resources. Take the right decisions, assigning the resources according their skills and availability. Follow up and compare plan versus actual dedication. Please fill out the form and try TALAIA OpenPPM for 30 days. You will receive an email confirmation.